We believe that health issues arise from all of the preservatives, sugars, heavy processing and harmful insecticides and chemical fertilizers in foods. At the Land of PureGold we only carry those treats that we would allow our own dogs to eat. Everything must be human-quality and for proteins, organic or free-range. For that reason, the cost may be somewhat higher. But, honestly, we believe our furkids are more than worth it. They have such a limited life span with us as it is, so we figure it is the least we can do to try and extend it by providing only the best. 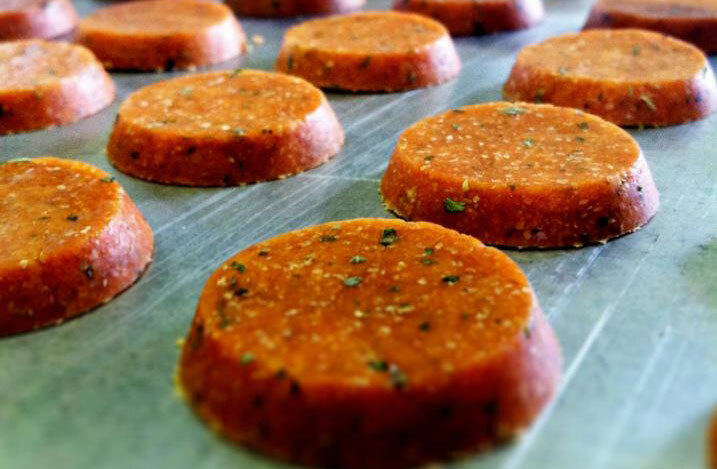 Our dog treats are always prepared using 100% certified organic, human-grade ingredients. The fat in the treats is derived solely from healthy beneficial oils of either extra-virgin coconut oil and coconut flakes or extra-virgin olive oil. Our products are always cruelty-free containing no ingredients from animal or human exploitation. We only use ingredients that have been produced without the use of conventional pesticides, synthetic fertilizers, sewage sludge, GMO or irradiation. We purchase from companies that use environmentally friendly manufacturing and farming practices. We only use whole foods in our dog treat recipes. Our products are produced in a clean way that does not harm the environment, our companions, or other living beings. All of our spices and herbs are Fair Trade Certified. Max & Ruffy's product offerings includes several different flavors, each offered in two sizes, "original" for mid to large dogs and "mini bites" for small dogs, training of any size dog, or for use in toys and games. The mini bites are now smaller than the circular pieces shown below. They are now in fun shapes (heart, star, bone). WE ONLY SELL THIS LINE IN 2 or 3-BAG PACKS. IT IS SIMPLY MORE ECONOMICAL THAT WAY. 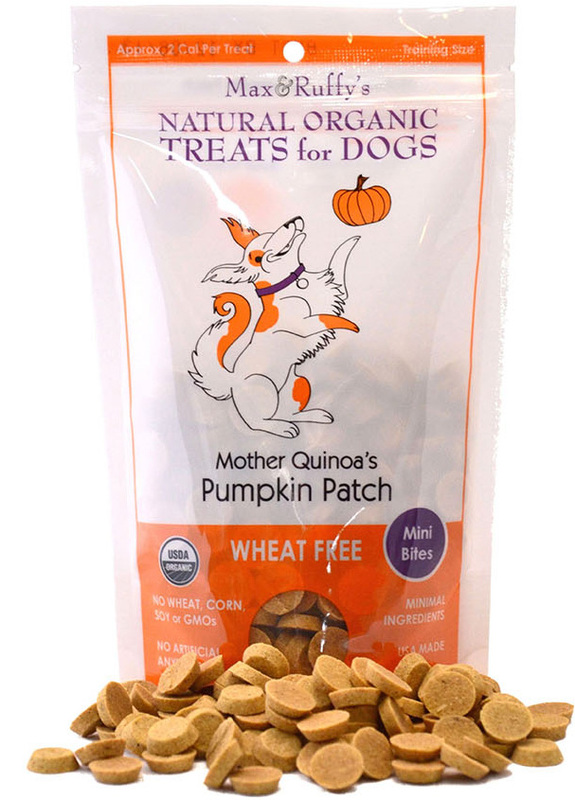 100% ORGANIC Mother Quinoa’s Pumpkin Patch . . . . . This flavorful, wheat-free recipe blends rich, nutritious pumpkin with the perfect complement of spices. 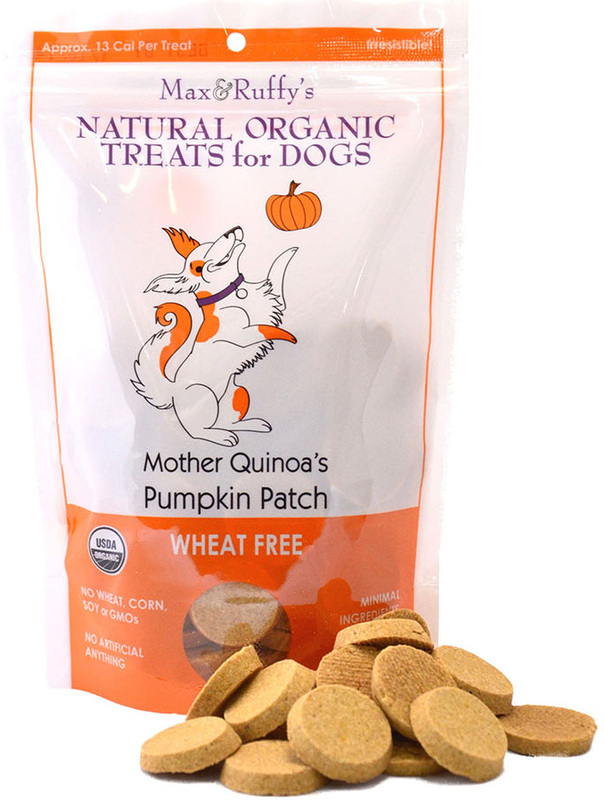 Irresistibly delicious, this treat is easily digestible and a favorite to many dogs. Crude Protein (min) 10%, Crude Fat (min) 8%, Crude Fiber (max) 2%, Moisture (max) 6%. Quinoa (pronounced Keen-Wah), from the Quechua word kinwa, originated in the Andean region of South America and has been a highly important food for the past 6,000 years. The Incas honored it as a sacred crop and referred to it as “chisaya mama” or “mother of all grains.” This staple crop was so highly honored that at the start of each growing season the Inca emperor would traditionally sow the first seeds using golden implements. IMPORTANT NOTE: Due to safety concerns, packages of treats cannot be returned once opened. BHA, BHT, and Ethoxyquin are three dangerous chemical preservatives that have been linked as cancer-causing agents, yet are still permitted for use by the pet food industry. In the United States, BHT has been banned for use in baby food, while Japan, Romania, Sweden, and Australia do not permit it to be used in any human food. Japan has also banned the use of BHA. Regardless of the known harmful effects of BHT and BHA, we continually see these harmful chemicals being used in a number of “big name” pet foods. In dogs, these chemicals have been linked to dry skin, allergies, dental disease, liver disease, kidney damage, and tumors. If these chemicals have shown known carcinogenic qualities why should we allow them to be fed to our canine companions? Ethoxyquin, which was originally developed for use in the production of rubber and as an herbicide, is currently regulated by the Food and Drug Administration (FDA) as a pesticide and permitted for use in pet foods as a preservative. The United States Department of Agriculture (USDA) also lists it as a pesticide. A study conducted by the Department of Pathology, Nagoya City University Medical School, Japan, found that BHA and ethoxyquin lead to stomach hyperplasia and cytotoxicity. Ethoxyquin has been found to pronounce kidney carcinogenesis, increase the incidence of stomach tumors, and enhance bladder carcinogenesis. The FDA, Center for Veterinary Medicine (CVM), has received numerous reports linking ethoxyquin to allergic reactions, skin problems, major organ failure, behavior problems and cancer. With the known dangers associated with ethoxyquin, the FDA only allows .5 to 5 ppm of residue in human foods, but still allows 150 ppm of it in food for pets and livestock. In 1997 the FDA’s Center for Veterinary Medicine (CVM) requested that the pet food industry voluntarily lower the ethoxyquin residue in pet foods to 75 ppm but there is still no mandatory requirement. Zero ppm would be a much healthier number. Propyl gallate is a chemical that is added by manufacturers to prevent spoilage. This is another widely used chemical preservative that is suspected of causing both liver damage and cancer. Used by the pet food industry to help retain water and give products their unique texture and taste, Propylene glycol is considered by some to lend to the cause of most health problems seen in dogs associated with chemical preservatives. Propylene glycol has been associated with causing dry-itching skin, hair loss, dehydration, excessive thirst, and tooth and gum problems. The FDA/CVM now prohibits the use of this preservative in cat foods after scientific studies have shown that propylene glycol reduces red blood cell survival time, renders red blood cells more susceptible to oxidative damage, along with other adverse health effects in cats after consuming this preservative. Although the FDA/CVM has prohibited the use of this substance in cat foods, it can still readily be found in big name commercial dog products. Sodium nitrate used as both a red color enhancer and as a preservative is yet another commonly found preservative in commercial pet foods. Also known as sodium nitrate, this preservative found also in processed meat for humans, has been shown in studies to produce powerful cancer-causing chemicals called nitrosamines. Keep in mind that most people feed their dogs the same food every day for years. While eating foods with these carcinogenic chemicals in them once in a while may not hurt a dog, eating it day in and day out can end up causing serious and completely unnecessary health problems. Because dogs eat the same brand of food over and over, it is important for dog owners to choose food that is healthy and free of harmful preservatives.